Any kid would give their left arm to be a vampire. Or maybe just their Xbox. And we can understand why. We would give up...well, we aren't sure what we would give up to become a vampire, but we would give up something. Maybe. Vampires are honestly the coolest mythical monsters. (They are mythical right?) Sure, a werewolf can turn into a wolf, but only on the full moon. A vampire can turn into a bat anytime they want. And sure they can't go in the sun, but that just means they wont get any skin problems. And just look at their awesome castles. It's no wonder why your kid likes them so much. 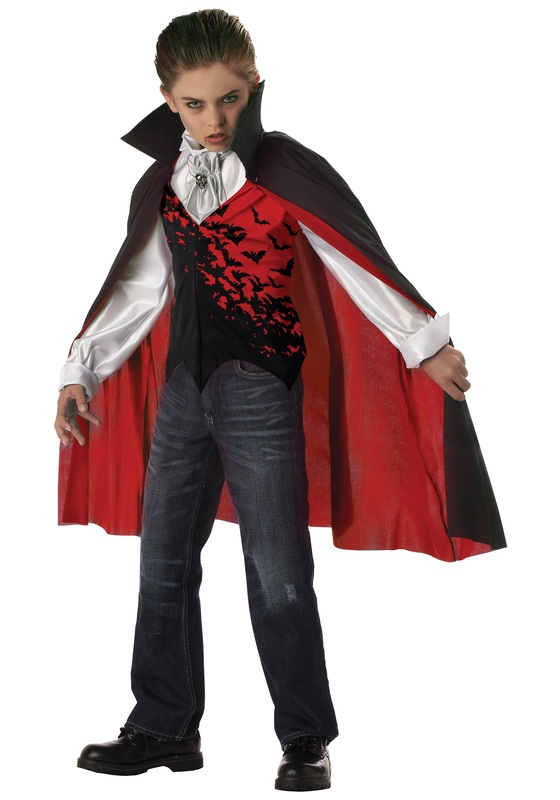 This Halloween let your little monster become one of the undead with this Kids Dark Vampire Costume. It will be hilarious to watch him try to "fly" around the room. Gripping both sides of the red, and black cape, flapping his wings, and jumping off furniture. You wont even be mad that he is jumping off the couch. And hey, you've been looking for ways to get him off the Xbox for a while now. He will be having too much fun with his friends, trick or treating, and scaring the little girls in their class to even think about the latest video game. Just don't forget to pick him up some vampire teeth to finish off his Child of the Night look. This vampire cape was kind of cheap looking and the vest was very stiff. Velcro defective and they replace with another defective one?!? I got my sons original costume and it had defective velcro on the cape 2 stiff side on the velcro .... not a stiff and fuzzy , then they personally checked the replacement cape and still shipped the SAME defective cape. :-( I called for another replacement they issued to options discount( to cover the fees to fix it on my own) or refund. I picked discount, but was offered only 10% ($2.00). Long story short only order of you want the same issues, I should have returned it but my son FINALLY picked this costume out and I dread looking for another one similar. Thank you for bringing this to our attention. We are working with our vendor to ensure this problem is remedied.